Guest Authored by Dr. Ulyana “Uly” Horodyskyj. Uly holds a PhD in Geological Sciences from the University of Colorado, Boulder. 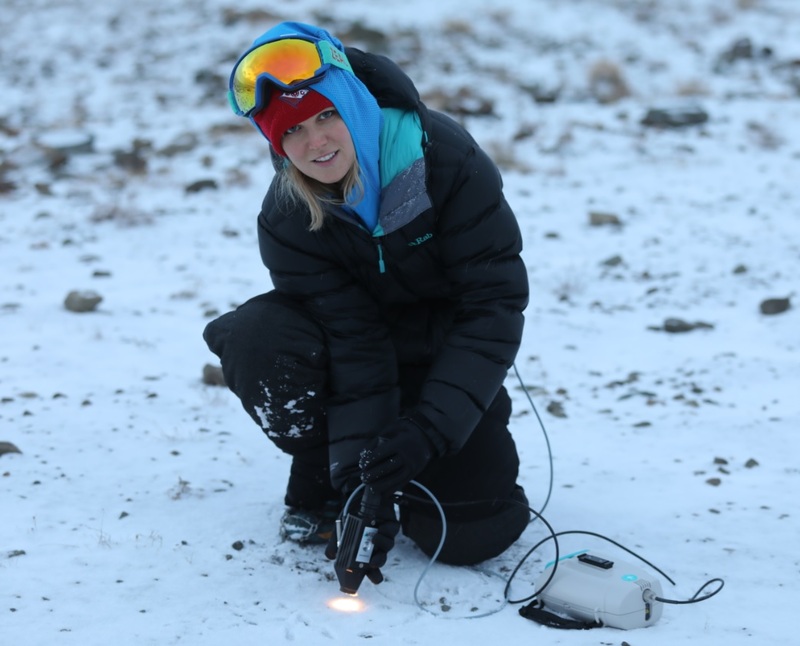 Her PhD work involved multiple field seasons traversing over a thousand miles in Nepal, collecting data on glacial lake changes and the effects of black carbon and dust on snow/ice melt. Prior to earning her PhD, she completed a B.S. in Earth Sciences at Rice University and a Master of Science in Planetary Geology at Brown University. Uly enjoys sharing her knowledge and working with students through National Geographic Student Expeditions (which took her to Iceland in 2009/10 and 2017) and the Girls on Ice science and mountaineering program on Mt. Baker in 2014 and the Gulkana glacier in the Alaska range in 2015, run through the University of Alaska-Fairbanks. Over the years, I have had the privilege of traveling the world in search of data and samples. As a glaciologist, this has included exploring and climbing some of the high peaks of the Rockies, Cascades, Andes and Himalaya. Most recently, through sponsorship from 7L, a UK-based extreme clothing company, I was afforded the opportunity to travel to the Arctic to take part in the filming of a documentary on climate change. The polar regions are especially sensitive to climate change and I was eager to have the chance to see it for myself. While I had been to Svalbard in the past, an archipelago just 650 miles from the North Pole, I had not experienced it during the fall season. Every day we lost 30 minutes more of daylight, as Svalbard approached “polar night,” when the sun does not rise again until mid-February! It was definitely a different experience (imagine having a sunrise at 10 AM and a sunset at 1:30 PM) and made working conditions challenging. We had to be efficient and safe, so as not to get caught out in extreme weather after dark. Armed with an ASD FieldSpec® HandHeld-2 (325-1075 nm), and despite atrocious weather (think hurricane-force winds and rain; yes, rain in late October! ), I was able to test the ASD spectroradiometer and Contact Probe, collecting snow samples and albedo data. I have used this instrument to gather snow and ice measurements in the past, and appreciate its ease-of-use, portability, and weight (1.2 kg or 2.6 lbs with 4 AA batteries); however, given that we only had a few hours of daylight and the angle of the sun was very low, I would not have been able to collect much usable data without use of the Contact Probe. Given the force of the winds and the accompanying wind chills, being able to use a Contact Probe had additional advantages: I did not have to de-glove to operate the instrument, as the buttons on the HandHeld 2 and Contact Probe are very glove-friendly; and, I was worried about battery life, given the cold temperatures, but keeping the batteries inside my jacket until ready for use helped and I did not encounter any issues. 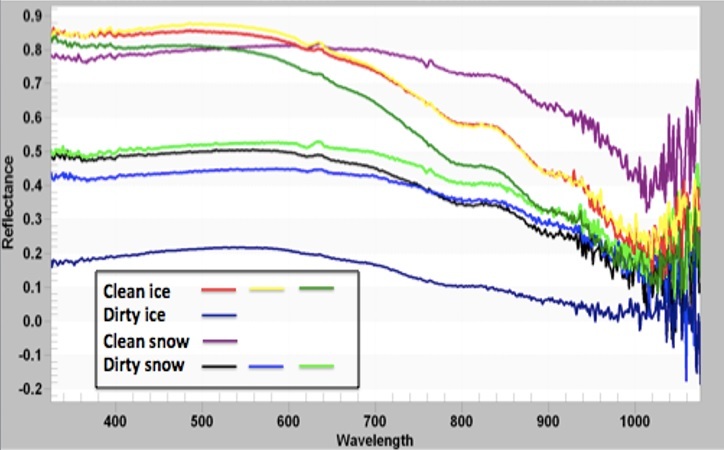 Snow and ice results using the ASD FieldSpec HandHeld 2. The clean and dirty snow are easy to tell apart, on account of their reflectivities. Near the end of the trip, we were attempting to get to the calving front of a tidewater glacier by speedboat, then land a Zodiac (raft) on shore, in order to explore the glacier on foot. The plan was to collect more data on the reflectivity of snow and ice using the HandHeld 2, along with physical samples. Unfortunately, we did not make it to our location as the waves were powerful and the currents dangerous. I have never been tossed around so much in a boat, and the captain advised turning around before we capsized. We lived to do science another day! Beginning 21 January, I will be guest teaching a class in the environmental program at Colorado College taught using a blend of science and technology. I look forward to teaching students how to make observations and measurements in the mountains while using state-of-the art equipment, including the ASD FieldSpec HandHeld 2 and ASD Contact Probe. It will be informative to take more Contact Probe measurements here in Colorado and then compare this with what was collected in Svalbard. In addition, it will be interesting to compare bare fiber-optic measurements, using the overhead sun, with the probe results. I look forward to what we learn and sharing this at the completion of the course!